The title of the Best Early Detection Pregnancy Test is a quest that every brand claims to be the winner of. Every woman who wants to know if she is pregnant or not wants to get the best early detection pregnancy test so that she can get an accurate result. But how do we judge or even define which is the best early detection pregnancy test? It is important to know that every woman has different needs. A particular pregnancy test good for one may not be as accurate for another. It depends on ease of use and timing of pregnancy test. Some women may prefer midstream pregnancy tests because it is easier than dipping strips. Others who need to take multiple pregnancy tests might find such midstream kits expensive. A pregnancy test, even if everything but not accurate is useless. The purpose of a pregnancy test is to detect the presence of hCG levels in a urine sample. During early pregnancy stages, the concentration of hCG is low in urine and you need to test using a concentrated sample. Taking pregnancy test early morning is best as your urine concentrates overnight. The accuracy of pregnancy test depends on two things, one how precisely it detects hCG and second is the clarity of pregnancy test results. Best accurate pregnancy tests have the lowest cases of false negative or evaporation lines. The occurrence of such wrong pregnancy test should be minimum in case of the best pregnancy test. The sensitivity of a pregnancy test depends on the lowest hCG levels that it can detect. A pregnancy test that can detect the lowest rise in hCG levels is the most sensitive pregnancy test. How early can you find you are pregnant? This also depends on the sensitivity of a pregnancy test. The levels of hCG double every 48 hours after implantation. Some women may take longer to cross the threshold value of 25 mIU/mL. The levels of hCG must be above 25 mIU/mL. A woman can attain this level within the first week near the due date. A sensitive pregnancy test will be able to detect this rise of hCG. The more sensitive the pregnancy test is earlier it can detect a pregnancy. You cannot believe the result of one home pregnancy test. You need to duplicate the test to be sure about the results. Even if you get a clear line or plus, it is essential that the results are duplicated. The chances of getting a false negative pregnancy test or false positive pregnancy test don’t permit you to rely on single testing. Thus the cost of a pregnancy test is not only the cost of one pregnancy test, but the total amount spent on home pregnancy tests. Some pregnancy tests that are expensive are more accurate. However, that is not the general rule. It could be possible that you get a Dollar Store Pregnancy Test and you still get accurate results. The accuracy of a pregnancy test alone cannot be the deciding factor. You may not be taking the pregnancy test at the right time. Pregnancy test after IVF keeps fluctuating and you get many false pregnancy tests. So, in that case, the accuracy of an expensive pregnancy test will not help you. Instead, a cheap pregnancy test will be worth it. Best pregnancy test is the one that has least chances of false results. A big fat positive pregnancy test confirms that you are pregnant. Evaporation lines are light marks that form after urine evaporates can confuse you. If you get a positive pregnancy test even when you are actually not pregnant, it is a false positive pregnancy test. There are cases of indent line in pregnancy test or false negative pregnancy test that reduce the probability of accurate detection. Finally, what is the point of having the most advanced machinery when you don’t know how or find difficult to use. A pregnancy test that requires a lot of care while handling or lots of steps is futile. Some women prefer midstream testing because you can pee on the stick and detect pregnancy. Other women are apprehensive about the idea of splashing urine over fingers. For them, a dip strip with a cup is the best pregnancy test. The First Response pregnancy test is synonymous with the best early detection pregnancy test. The best attribute of this pregnancy test is that it is extremely sensitive and can detect low hCG levels. Most pregnancy tests have sensitivity lying in the range of 20-25 mIU/mL. This level of hCG is attained when the woman is a week past implantation. However, the First Response Pregnancy Test can detect hCG levels just above the basal level of 5 mIU/mL, around 6.5 mIU/mL. One can either take a dip strip or midstream test using First Response Pregnancy Test. There is a digital pregnancy test that can connect to your mobile phone and help track pregnancy. The standard one is less sensitive but cheaper. The accuracy of the First Response Pregnancy Test is more than 99%. This implies that out of 100 tests only 1 may be false, rest all are accurate results. The cost of the First Response Pregnancy Test despite its features is not prohibitive. When one talks of the best home pregnancy test for early detection, Clearblue pregnancy test is next in line. The week calculator of Clearblue pregnancy test is a unique feature that detects how far the pregnancy has proceeded. The non-digital Clearblue pregnancy test has a plus sign when the result is positive. There are separate result windows for control and test lines in the pregnancy test. One can detect pregnancy five days before missed period using Clearblue pregnancy test. 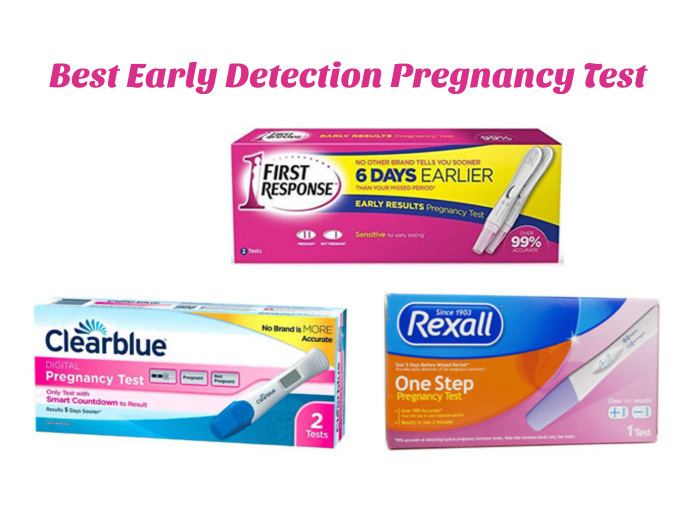 A cheaper alternative to other best early detection home pregnancy tests is Rexall One Step Pregnancy Test is a good choice. You can take both midstream and dip strip pregnancy test using One Step Rexall Pregnancy Test. The test is sensitive and accurate but cannot detect pregnancy as early. However, when compared to other pregnancy tests for early detection Rexall Pregnancy Test is more accurate. The positive result is a plus sign. Most pregnancy tests have no symbol or simply the absence of the test line as a negative result. However, Rexall Pregnancy Test shows a minus sign when the pregnancy test is negative. We hope that this article made it easy for you to decide the best early detection pregnancy test. So take your tests now and do share your good news with us! ??? ?